I saw this 328 Mille Miglia on GermanCarScene.com today and had to feature it because it's just so beautiful. The Mille Miglia has spawned many cars with the same moniker because it was such a demanding race. And if your car won, it was an amazing feat against both the other competitors, the course and the weather. This particular BMW 328 is making itself known because it's being auctioned off by RM Auctions. They seem to get all the beautiful and fantastically expensive car these days. The 30's is one of my favourite periods of automotive history because so many of the cars looked this good and went very fast. Maybe a bit light on the handling and stopping but they looked great and sounded magnificent at speed. Not many cars do both these days. Less than 500 328's were built. They all had tube frame chassis with a 2.0 litre inline six that boasted approximately 80hp. This racing one however has 140hp. Not a huge amount sure but when the car it's had to push only weighed 1830lbs it could do over 100mph. 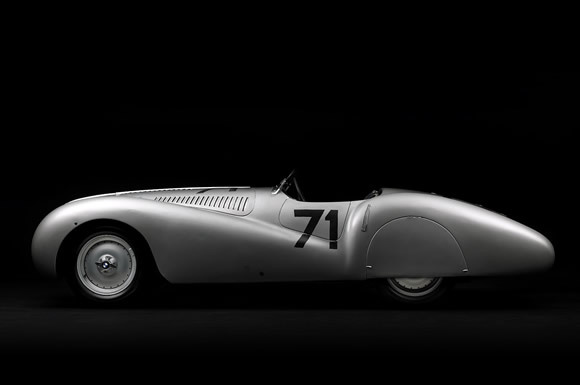 Why this particular 328 is so rare is because it was built to race in the 1940 Mille Miglia and the special lightweight body was welded to the tube frame. This created a lower center of gravity because the driver and engine could sit lower. It also has a great story. It was part of reparations after the war and was even driven from Russia to Germany after the fall of Communism. Great stories equal a lot more money and I expect this BMW to fetch a large price. One thing I notice though is how there are design cues that have carried on to this day. The main one being the lines across the top of the guards. It's like BMW is looking backwards to create today's car and that can only be a good thing. Incredible. A beautiful photograph of a beautiful car. Thanks Chris. I had a lot to choose from but this one really stood out for me. I stare at the lines on this pre-war 328 MM for a while, and I wonder whether Jaguar studied it when they were drawing up the XK120. Glenn, thanks for posting this. I'm certain Jag looked long and hard at this car Shaun. I think it's a car that has influenced many car manufacturers.